Today was a close one...I had some chicken tenders and cooking orders to make something "substantial" for my hungry family. With these petite strips of white chicken meat and only 30 minutes in which to cook dinner, my mind went bouncing around without really hitting on any idea except "pizzaiola." The pressure was on! Geez, you think the Iron Chef battles could be more intimidating? Since I was in a hurry, I didn't get a chance to make careful note of my measurements (in fact, I didn't measure at all! ), but I do so want to share this great dish with you. Hence, today's recipe is coming in a slightly different form: as a play-by-play, if you will. Hopefully this rough sketch will be just the right inspiration to get your creative juices flowing! I next turned my attention to those chicken tenders. I don't know about you, but every time I see or hear of chicken tenders, I think of restaurant kiddie menus pandering to the idea that kids shouldn't try exciting new foods.... I also start wondering, who separates all those tenders from the backs of the chicken breasts?! But anyway, there were the chicken tenders and I had to do something with them. I sprinkled each side with sea salt and freshly-ground black pepper, then dredged them in all-purpose flour, shaking off the excess. These I placed right into a hot pan coated with vegetable oil (which has a higher smoking point than olive oil, and is therefore better suited to pan-frying) and cooked them until done through and golden brown on the outside, turning several times. 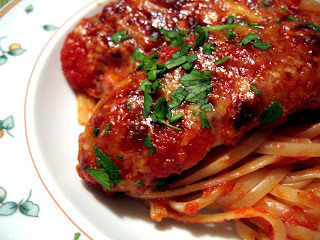 When they finished cooking, I placed them in a shallow ceramic baking dish, adjusted the seasoning of the red sauce with salt and pepper, and then poured 2/3 of the sauce over them, making sure each piece of chicken was completely covered by the sauce. To stay on track with dinner, I salted the (now boiling) pasta water and tossed in some linguine, which, according to my package, needed only 7 minutes to cook. While it cooked, I sprinkled grated mozzarella and Parmigiano cheese evenly over the sauce-covered chicken, then popped it under the broiler until the cheese was melted, bubbling, and golden brown. Oh, what a gorgeous cheesey crust that was on top! When the pasta had finished cooking, I tossed it in with the remaining sauce coat and then divided it among heated bowls. Fending off a ravenous, clamoring self and equally ravenous parents, I topped the linguine with the pizzaiola-style chicken and a pretty sprinkling of finely-chopped fresh Italian parsley. Dinner was served! And we ate! And it was good. Sounds like a terrific busy night meal! I will definitely try this when I am pressed for time but still want a home cooked tasty dinner. I just made this and it was wonderful. To the other novices out there, make sure to get the flour on the chicken nice and browned. I think mine ended up being just a little soft for my liking.